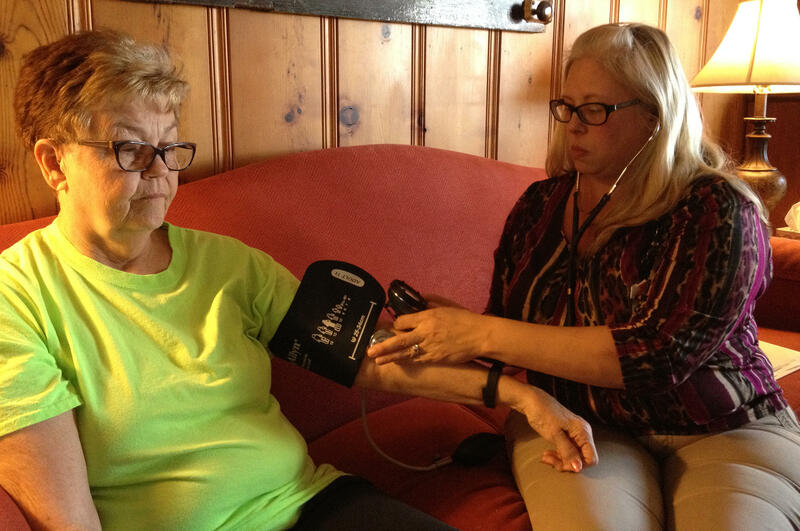 Social worker Christy Kaufman, right, checks Karen Dunn’s blood pressure during a visit to Dunn’s home in Plainville. Kaufman helps patients of Post Rock Family Medicine manage their health care. Doctors and nurses are obviously essential to any primary care medical team. But when it comes to managing a chronic health condition, a social worker could be the most valuable player from the patient’s perspective. That’s what some Medicare patients in and around the small northwest Kansas town of Plainville have been discovering since January of last year. That’s when the town’s primary care clinic, Post Rock Family Medicine, hired Christy Kaufman to provide care management. 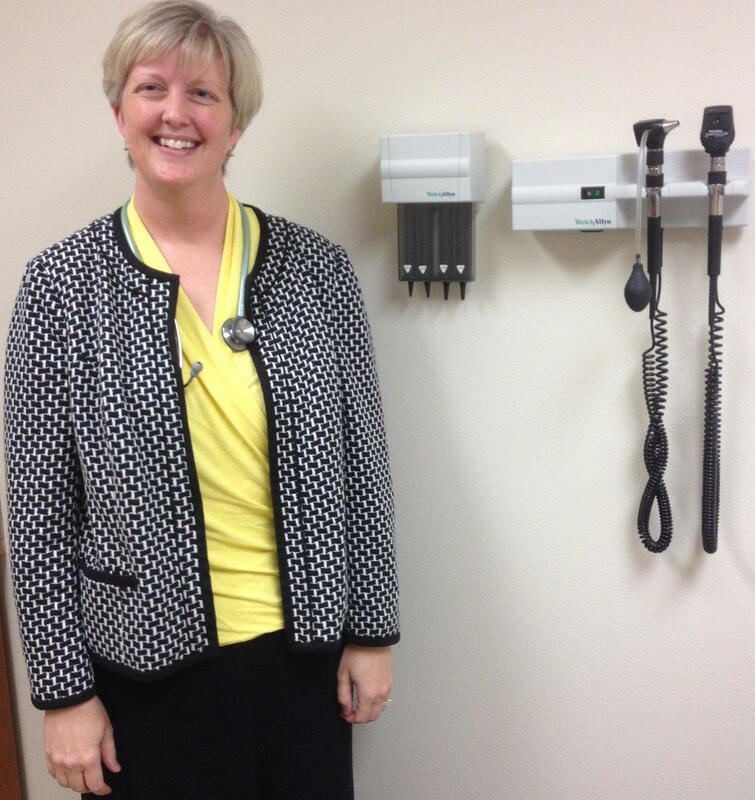 She works with patients who need the most help with multiple chronic health conditions. They often struggle — for various reasons — to comply with doctor’s orders. But unlike most people who provide this kind of care management, Kaufman is not a registered nurse. She’s a social worker. That means she has a different “set of tools” than a doctor or nurse might have, according to one of the physician co-owners of the practice, Jennifer Brull. As a social worker, Kaufman knows about resources available to help patients with things that might not meet a strict definition of medical care but have a great deal of bearing on their health. Kaufman looks for creative solutions to those problems. In one case where a man needed IV antibiotics twice a day to avoid hospitalization, she arranged for his family members to get a $5 gas card every time they made the trip. And if the patient can’t come to the clinic, Kaufman makes house calls anywhere in the area that Post Rock serves — a radius of about 60 miles. 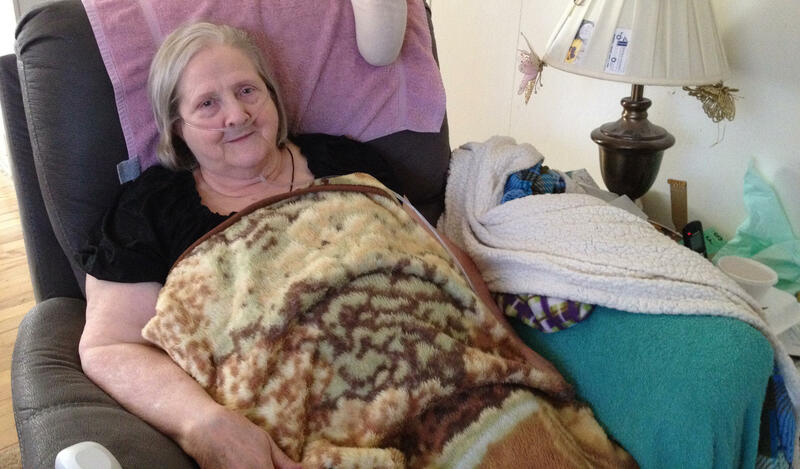 She recently paid a visit to Judy Dinkel, who lives in Plainville. Dinkel, 72, has numerous health problems: bladder cancer, diabetes, lung disease. She told Kaufman she was having ongoing pain and cramping from constipation, and laxatives weren’t helping. Kaufman quickly called Brull, who ordered a stronger laxative. Judy Dinkel of Plainville says social worker Christy Kaufman serves as “the bridge” that gets her across any obstacle to the medical care she needs. But Dinkel, who shares a car with her son, didn’t have a way to get to the pharmacy to pick it up. 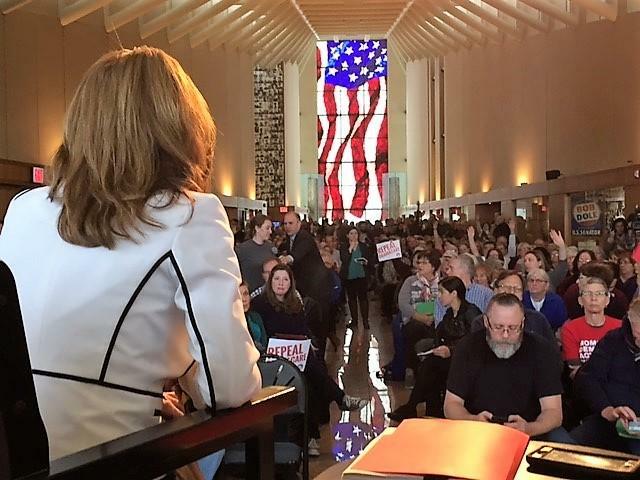 Her son had the car in Hays, where he works. So Kaufman agreed to get the medication and bring it to Dinkel’s house later that afternoon. Before Kaufman stepped in, Dinkel was skimping on her medication to cut down on monthly out-of-pocket costs. That’s why she was taking her pills every other day, instead of daily as prescribed — which is no way to control chronic health conditions. Kaufman connected her with a mail-order pharmacy, which provides Dinkel with a three-month supply of medication for about the same cost she had been paying every month. Brull said that kind of success story is becoming routine. By hiring a social worker, the clinic aimed to help its Medicare patients get better, more timely access to care. Under a provision of the Affordable Care Act, Medicare started reimbursing medical practices for chronic disease management services in 2015. Dr. Jennifer Brull of Post Rock Family Medicine in Plainville says hiring a social worker is a risk that has paid off for the clinic. “I would say it has been the single best innovation in our practice in probably the last five years,” she says. Post Rock Clinic is part of a network of clinics known as an accountable care organization, or ACO, that uses patient data to help them reduce emergency room visits and hospitalizations. A Maryland-based company called Aledade partnered with Post Rock and other Kansas clinics in May 2015 to form an ACO. “This is something we never would have done without this ACO,” Brull said. 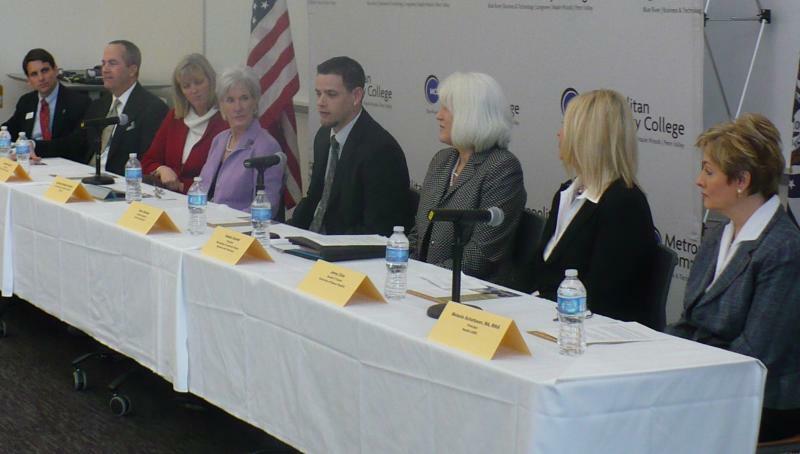 The ACOs get a cut of the savings created by coordinated care. Of the 200 practices Aledade is partnering with across 15 states, only seven employ social workers to streamline care. Most are using registered nurses exclusively for that. When Post Rock hired Kaufman last year, the investment wasn’t a sure thing. “It’s very nerve-wracking to hire another professional, and have the cost associated with hiring that professional, and not know where that was going to take you,” Brull said. But the decision has worked out, she said, with the social worker position more than paying for itself. And the little things Kaufman does have created huge benefits for patients. “I would say it has been the single best innovation in our practice in probably the last five years,” Brull said. Dinkel, her patient, would agree. She described Kaufman as “the bridge” that gets her across any obstacle to the care she needs. And don’t try to tell her that the service Kaufman provides might be helpful but aren’t really medical care. Bryan Thompson is a reporter for the Kansas News Service, a collaboration of KCUR, Kansas Public Radio and KMUW covering health, education and politics. Follow him on Twitter @KSNewsBryan. Kansas News Service stories and photos may be republished at no cost with proper attribution and a link back to kcur.org. Accountability. It means taking responsibility for an action or result. Lately, it’s taken on a new connotation in the field of health care. The Affordable Care Act provides a way for health care networks to get bonus payments by providing better care, and keeping Medicare patients healthier. These Accountable Care Organizations are about to have a larger presence in Kansas. Kansas has been slow to adopt Accountable Care Organizations, or ACOs. Fewer than 4 percent of the population is enrolled in some form of alternative payment model, like ACOs. The health industry comprises nearly one fifth of the nation’s GDP, but up until recently, relied mostly on paper files.